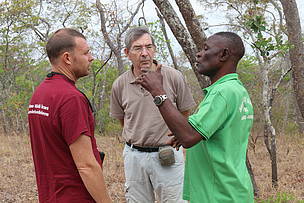 WWF Tanzania is in a process to develop a Beach to Bush project in the Southern Tanzania Tourism Circuit. This was shared by the Selous Ruvuma Landscape deputy coordinator Mr. Asukile Kajuni during a field trip by the Selous Ecosystem Conservation and Development (SECAD) conservation partners in the Ruvuma Landscape. The B2B willl include the historic sites of Kilwa and Mtwara Mikindani, the traditional and cultural areas of: Makonde, Yao, Makuwa, Dendeule, Ngone, Matengo, Ngindo and Matumbi, linking to Rondo Nature Reserve, LukwikaLumesule, Msanjesi, Selous, Mwambesi, Liparamba game reserves and Lake Nyasa and all the intervening Wildlife Management Areas such as Nalika, Mbarang'andu, Kimbanda, Kisungule and Chingoli to attract tourism business in the area. Mr Kajuni emphasized the importance of Selous-Niassa Wildlife Corridor and hence the need have it protected to ensure large mammals are preserved for promoting eco-tourism opportunities in the area.The aim of the visit was for the SECAD partners to witness challenges and threats to Selous-Niassa Wildlife Corridor, an important umbilical cord linking Selous Game Reserve (Tanzania) and Niassa National Park (Mozambique). Selous Ecosystem Conservation and Development (SECAD) is an Euros 18 Million five year project funded by the Germany government through KfW to support an integrated management of Selous Game Reserve and the surrounding buffer zone, comprised of Mbarang’andu, Nalika, Kimbanda, Chingoli and Kisungule WMAs, so as to maintain the integrity of the Selous-Niassa Wildlife Corridor (SNWC). In his speech, the Mbarang'andu Wildlife Management Area Secretary Mr Leopold Ndiwu said the community has received some benefits due to participation in wildlife conservation initiatives in the WMA which include 190 beehives in seven member villages for beekeeping and an additional 40 modern beehives around Kahunde natural dam in Likuyu Sekamaganga village. Mr Ndiwu added that other benefits they have received include the construction of village office building; solar power panels in Mtelawamwai, Kitanda, Kilimasera and Nambecha villages; office furniture that includes 14 tables, 37 chairs and 3 drawers for each member village; 60 percent share revenue from the hunting investor through the District Council of which 50 percent is distributed to member villages. The Namtumbo District Commisioner Ms Sophia Kizigo congratulated Mbarang'andu WMA leaders and member villages for beekeeping and fish farming projects. She noted that 44.4 percent of the people in Ruvuma have malnutrition and advised the WMA to produce enough fish for people to consume protein to reduce the problem in the Ruvuma region. During the field inspection visit, the team witnessed major challenges and threats facing WMAs conservation including increased human activities and encroachment by agricultural expansion, livestock incursion and people settlements inside the WMAs. 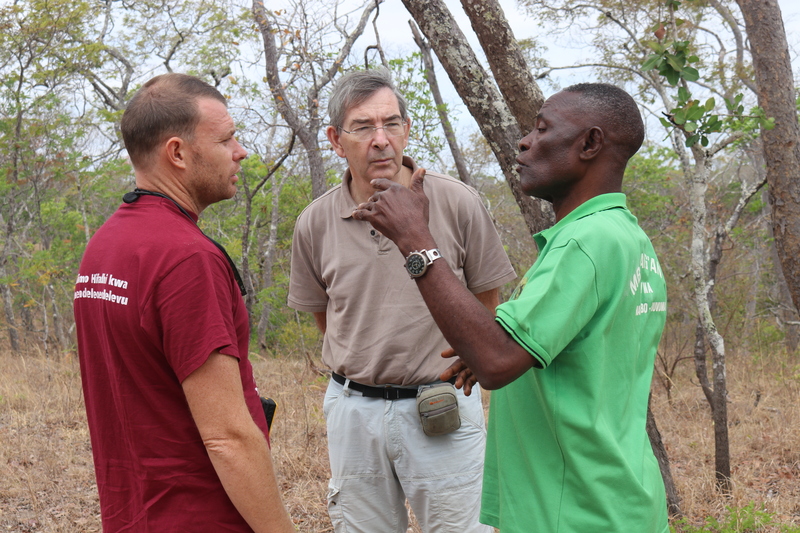 The International Infrastructure Advisory Company (GOPA) led by Dr. Neil Stronach emphasized the need to improve the Selous ecosystem infrastructure that involves Wildlife Management Areas which should be very strategic and focused. “Due to limitation in resources and the huge demand for infrastructure within the Reserve, we will prioritize Mbarang’andu and Nalika WMAs to be supported for the construction of Village Game Scouts outposts while Kimbanda, Kisungule and Chingoli will follow in the next phasing of SECAD program” he said. Among those on the visit included the International Infrastructure Advisory Company (GOPA), the German Development Bank (KfW), the Tanzania Wildlife Management Authority (TAWA), and Namtumbo District Council. This was the inception visit after the roll out of the Selous Ecosystem Conservation and Development (SECAD) project’s that is being implemented both within the Selous Game Reserve and in the adjacent surrounding Wildlife Management Areas.